Regression models using count data have a wide range of applications in engineering, econometrics, medicine and social sciences. Poisson regression models are widely used in the analysis and prediction of counts on potential independent variables. However, the presence of outliers can lead to inflated error rates and substantial distortions of parameter and statistic estimates. In this study, three methods of identification of outlier are used which are DFFITS, DFBETAS and Cook’s Square Distance (CD). The objective of the study is to investigate on the performance of the three detection methods (DFFITS, DFBETAS, and CD) in Poisson regression using simulation in R. A simulation study was performed with various regression conditions which include different number of predictors, sample sizes and percentage of outliers in the X-space, Y-pace and both X-and Y-space. The best outlier detection method is the one that can detect the most number of outliers. Results show that for outliers in X-space and Y-space, DFFITS performs better in detecting outliers for all sample sizes with low percentage of outliers while DFBETAS performs better for most of samples sizes with high percentage of outliers. In both X-and Y-space, the best method in detecting outliers for small sample size with low percentage of outliers is DFFITS. However, for large sample size, CD and DFBETAS perform better in detecting low and high percentage of outliers, respectively. Similar results were obtained when these methods were applied to a real data set. 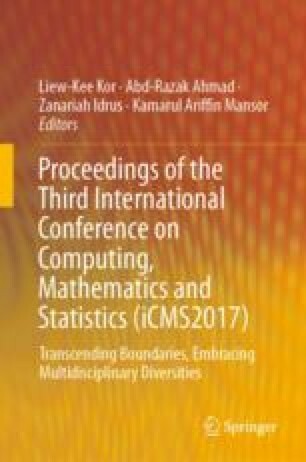 The authors wish to thank the Faculty of Computer and Mathematical Sciences, Universiti Teknologi MARA (UiTM) Shah Alam for the conference support fund.